Groggy-eyed children, chaotic mornings, band sectionals, football practice, complicated login processes searching for online assignments which haven’t been uploaded by the teacher yet; yes, parents are busy. (I have three children myself: 12, 10, and 3). 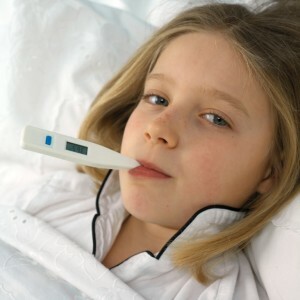 Then there are the viruses: strep, GI bugs, and fever — just to challenge the sanity of even the most experienced parents. My 3-year old slept on a pallet next to my bed last night, running fever all night. His breathing was loud, due to all of the clear mucus draining from his nose, waking me up about 5 a.m.
Maybe this is good for him after all, in a character-building, P90X kind of way? Here was my thinking: the immune system really is quite amazing. Think of just the white blood cell (WBC) count, a component of one of the most basic lab panels. A normal WBC count is between 5 and 10, which represents 5,000 to 10,000 cells per milliliters of blood (about 20 drops). Incredible! When an intruding virus hits the nasal mucosa, causing the damage leading to the snot and inflammation, the alarm is sounded. Through extremely complex intercellular messaging, a fresh army of WBCs are released from the bone marrow, along with legions of new cells. The new cells learn the protein code of the virus, crafting unique antibodies which defeat the current invaders, as well as patrol the blood permanently, should the virus ever try to come back. Fever is a very important part of this process, being triggered by a cellular messenger from the WBCs, which resets the hypothalamic temperature control center of the brain. Maybe it slows the replication of the virus during the battle? Or maybe it slows my active toddler, so he can focus his strength on the massive protein synthesis required for the new cells, antibodies, and repair of virus-damaged tissue? Whatever God had in mind, it’s definitely not harmful to the little guy. In two or three days, when the battle is over and the fever subsides, his immune system will have exercised itself, being stronger. In 15 years, loaded with a robust complement of antibodies, earned one fever at a time, maybe he’ll beat new infections a little quicker, when antibiotics are resistant and viruses scarier? So where do antibiotics fit into the picture? Should I start my 3-year-old on a course of Zithromax? Thinking it through, antibiotics won’t contribute anything to the battle with the virus or the synthesis of proteins for antibodies. They could also wipe out his good intestinal bacteria, leading to diarrhea and a slower recovery. I’d better stick to supportive care then for now: plenty of fluids, a nice long nap, ibuprofen and Tylenol, to help blunt the achiness and misery caused by the intercellular messenger chemicals. Now. confession time: As a dad and an ER-trained pediatrician, I’m guilty of calling in plenty of courses of antibiotics and a round or two of Tamiflu for my kids, just in case it could help them, or save my wife and I one less day of fever and no child care. So when are antibiotics and antivirals needed? And what about risk thresholds for treatment versus non-treatment, vaccines and flu shots, and diagnostic test sensitivities? These will be topics of future articles, but for now I would summarize that treatment is needed and available for strep throat, pneumonia, ear infections, and the flu. Let your pediatrician or the experienced physicians at Elite Care 24-Hour Emergency Room help sort this out for your child next time fever strikes. Until our next article, I hope for good health and success for your young scholars this new school year!